The beauty of simplicity of Countess Lydia Swarovski earrings by using white pearls interspersed with crystal beads are perfect for an elegant bride on her wedding day. 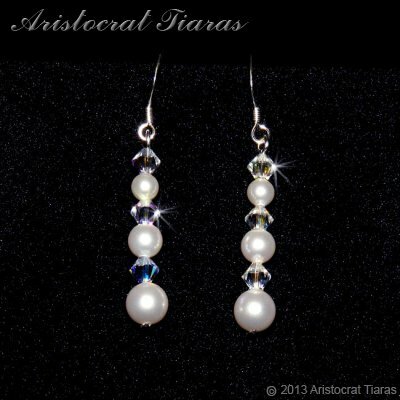 These crystal earrings from Aristocrat Tiaras are designed to match the Lady Aurelia necklace and to compliment our bridal tiaras such as Princess Aurora tiara. All our bridal jewellery are handmade in Herefordshire UK and suitable for many occasions! Colour and designs may vary slightly from the picture.